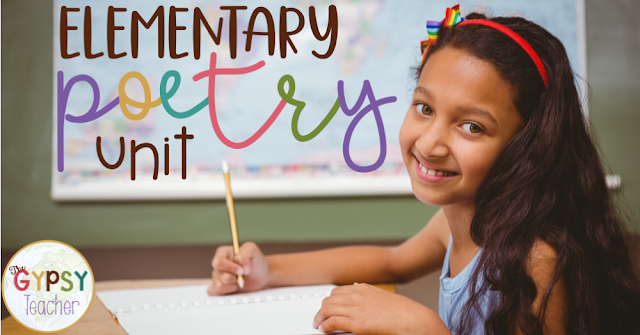 April is National Poetry Month, but Poetry can be taught all year long! I planned my fourth grade poetry unit for April, so that we could wrap it up with a Poetry Café room transformation the first week of May. It turned out to be one of my favorite writing units to teach, but it was daunting at first, because I hadn’t taught poetry before! 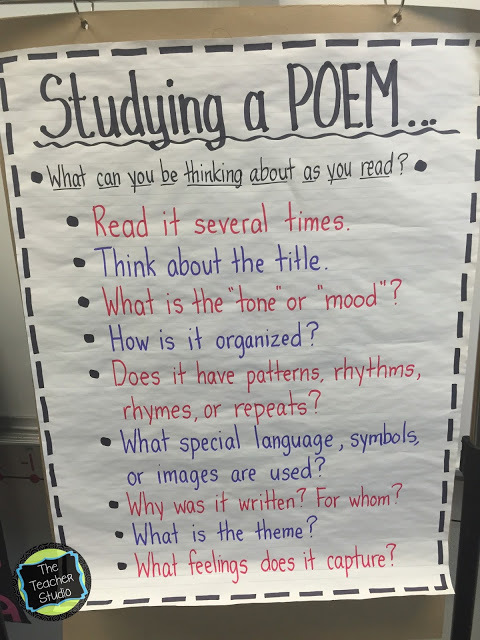 So, I did lots of poetry lesson plan research, and am excited to share what worked great for us. If you’re in my boat, or you’re just looking to mix up your poetry unit for elementary or middle school, this is for you!! 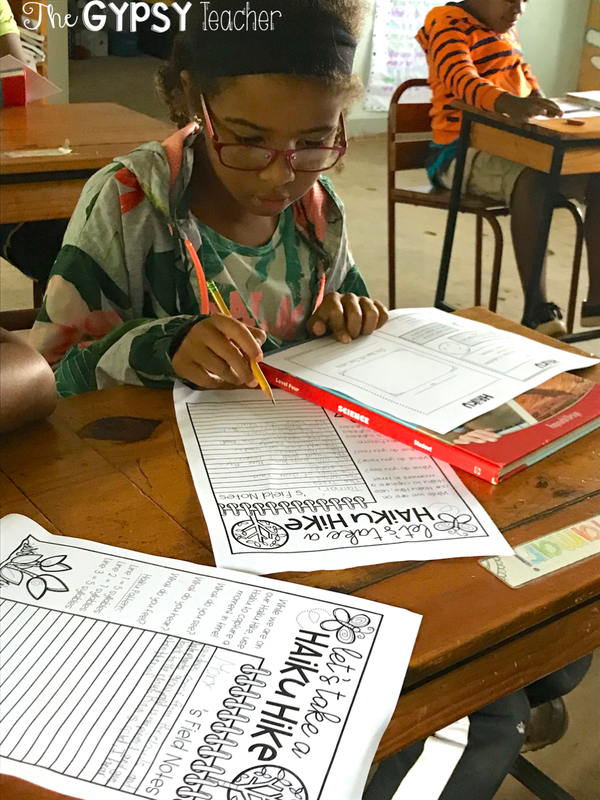 My students didn’t have any background knowledge on figurative language, so we first spent time on that, because it makes up so much of the poetry we read! 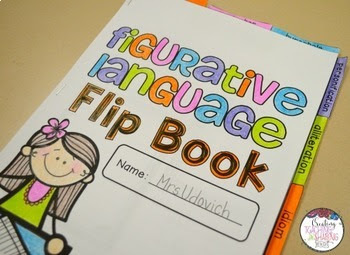 I purchased Joey Udovich’s Figurative Language Flip Book and it helped us practice each element. 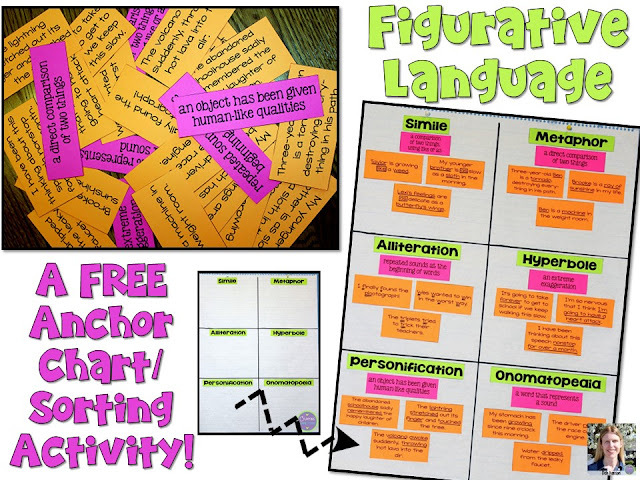 I also downloaded these free Figurative Language Posters to introduce each element. 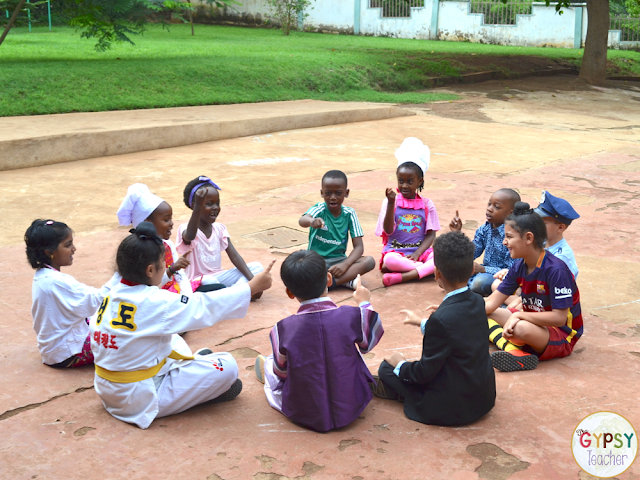 We focused on one or two elements per day. 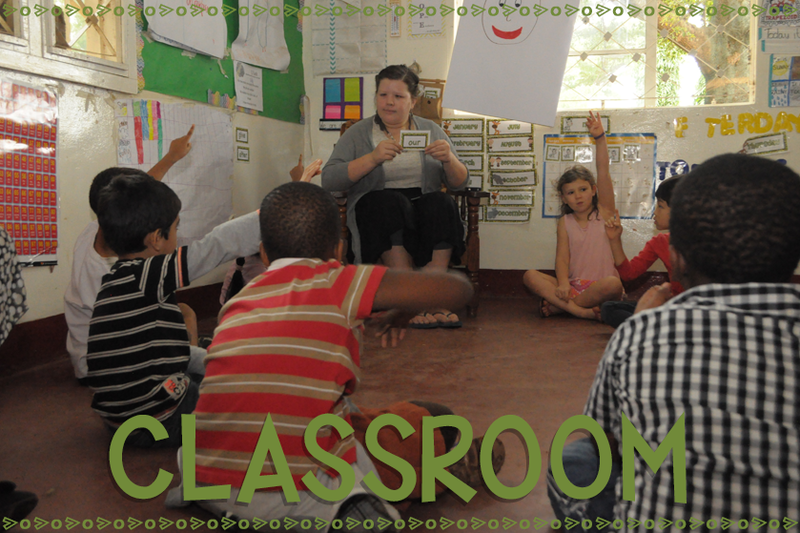 I chose to teach – simile, metaphor, hyperbole, personification, idioms, alliteration, and onomatopoeia. After spending the week learning about figurative language and putting it into practice, we reviewed with Deb Hanson’s free sorting activity! It was great to have students justify why they sorted the components how they did. We used the posters from earlier to help us if we got stuck, too! I first connected music to poetry, and we read and discussed some song lyrics. We tried to detect figurative language too! 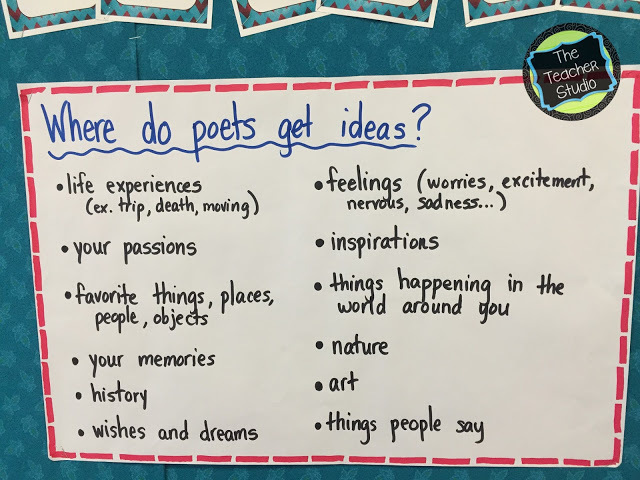 Then, we talked about how we would be writing our own poems, and we generated a list of ideas for poets, using this anchor chart. The next day, we studied a poem. This lesson came directly from The Teacher Studio. 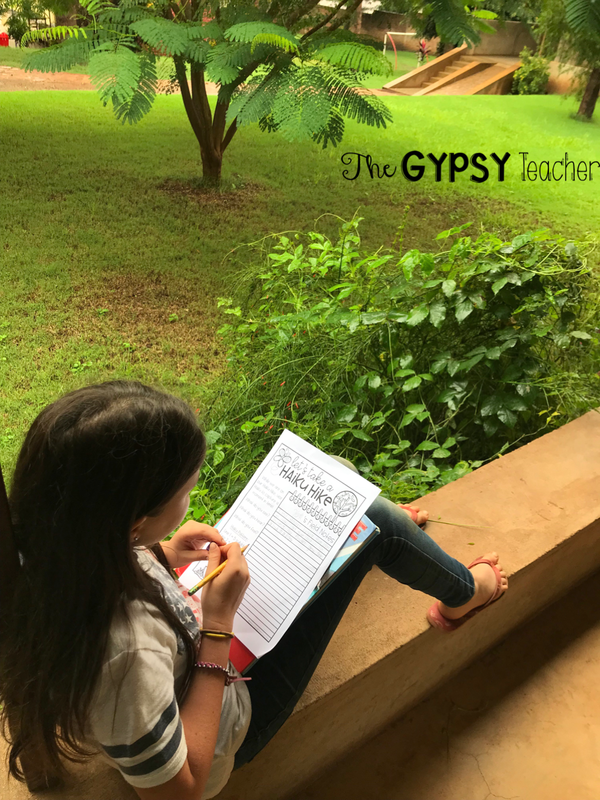 So, I will direct you to her awesome blog post and free lesson! 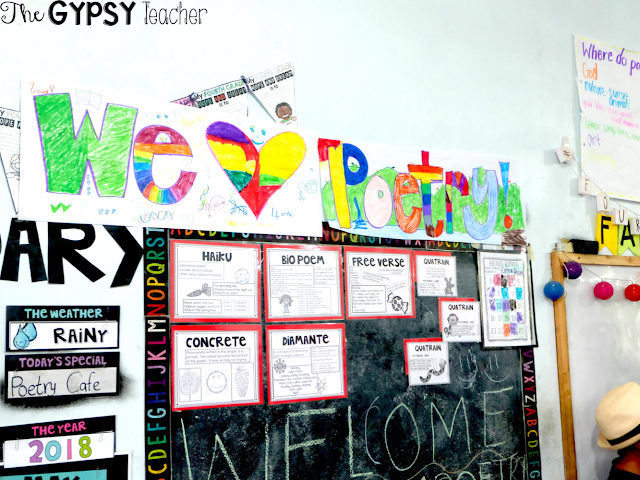 This helped my students get familiar with poetry, and our discussions were awesome! If you are only able to purchase two resources for your poetry unit, I would suggest the Poetry Unit Bundle by Rockin Resources and the Poetic Elements Gallery Walk from Amazing Materials for You. 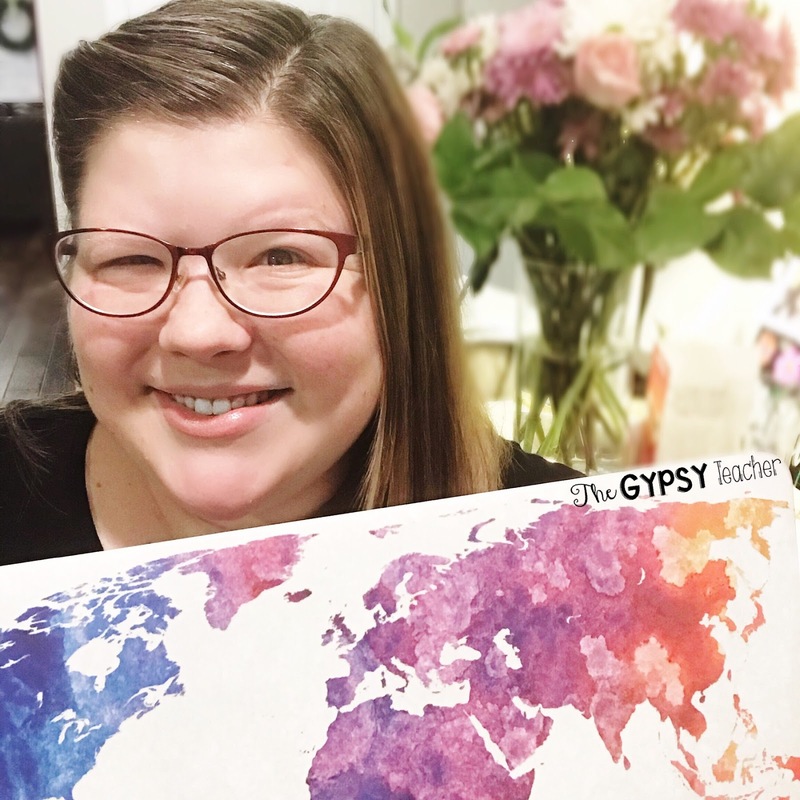 These resources are both worth their weight in gold, and I truly believe in saving time by purchasing fabulous resources from other teachers! I used the Poetry Bundle throughout my entire unit…Rockin Resources gives you everything you need to teach the different kinds of poetry and even gives the poem-writing sheets for your students to write their poems on. 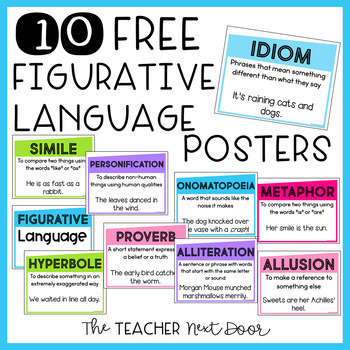 She also includes Poetic Elements posters, which I used to connect figurative language to poetry, and teach my students how to use poetic elements. 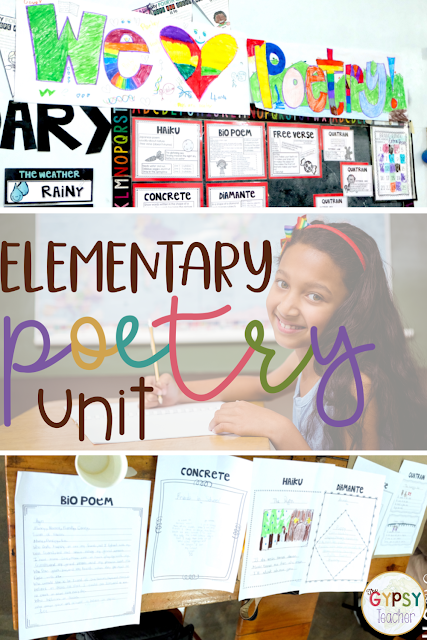 We used the Poetic Elements Gallery Walk on Day 3, after introducing poetic elements with the posters from Rockin Resources. To set up the gallery walk, I looked up the poem suggestions in the resource, and printed several of them out. 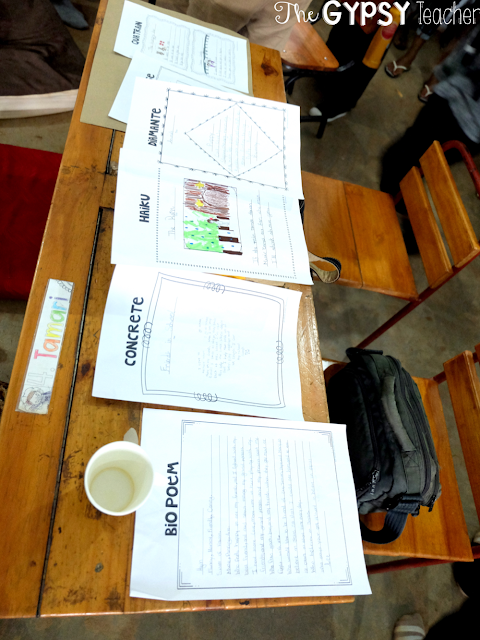 I also printed some of the graphic organizers in the resource and made booklets for each student. I taped the poems up outside, in our outdoor hallway. And then challenged students to find the poetic elements in the poems and fill out the organizers! Some were easier than others to find, but this really helped solidify figurative language and poetic elements! Now it’s time to get to the Poetry Writing! 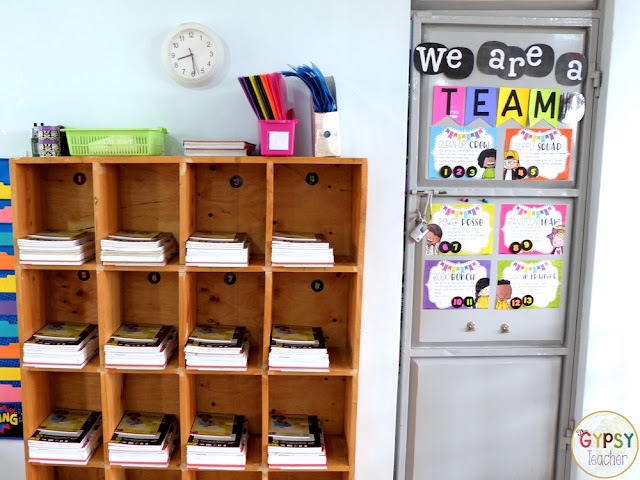 I tried to keep everyone organized with a Poetry Portfolio – a folder with all of the poems they have written and will write. There is a cover that I printed for each student to color and glue on the front in the Poetry Bundle. I printed out both the Large Poetry Portfolio and the Small Poetry Portfolio pages that we used. 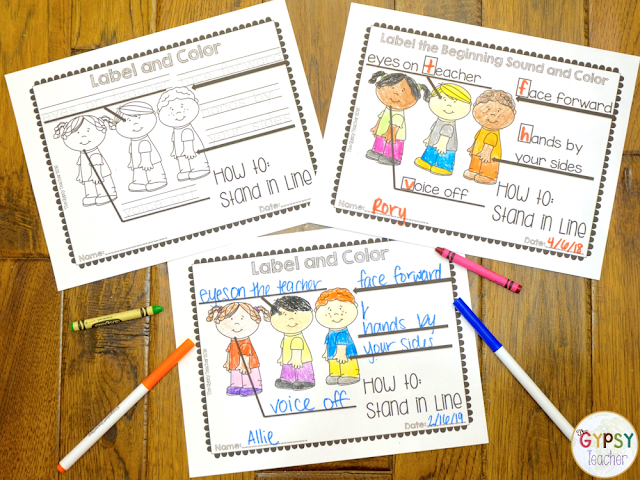 The small pages also had the anchor charts next to them, and I used those for our rough drafts. Once they wrote the rough draft, they would come show it to me, we would fix mistakes, etc. Then they would copy the final draft onto the large poetry pages. We started with the Haiku Poem. 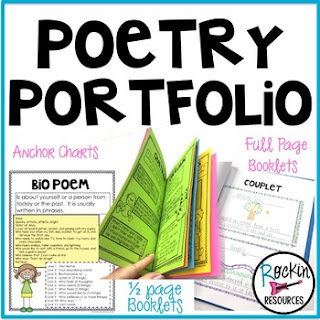 I used the Poetry Slam anchor charts to introduce all of the poems from the Poetry Bundle. We discussed how these poems all have to do with something in nature. So, we went outside to get ideas for our haikus. 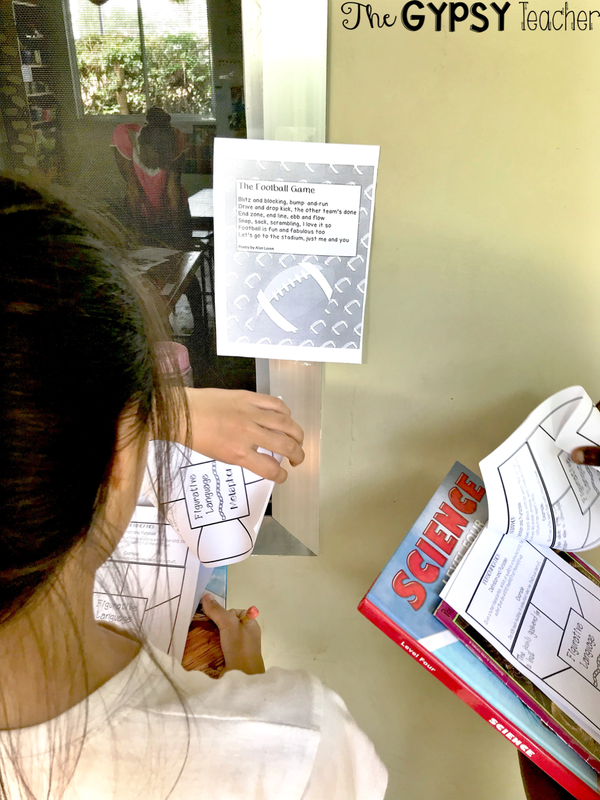 We used this Haiku Hike freebie to brainstorm ideas! 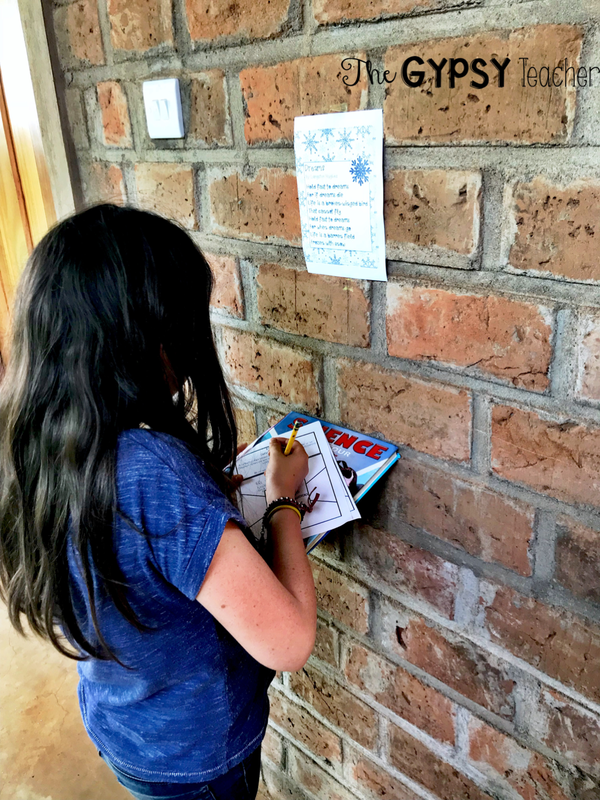 After we took field notes on what inspired us on our HaikuHike, we tried our hands at writing haiku poems! I really encouraged students to capture one moment in nature in their poems. This is when we really dove into writing more poetry. I chose seven poems to teach my students and to have them write. I found examples online to show them, but I would recommend these poetry books to find awesome examples and inspiration! 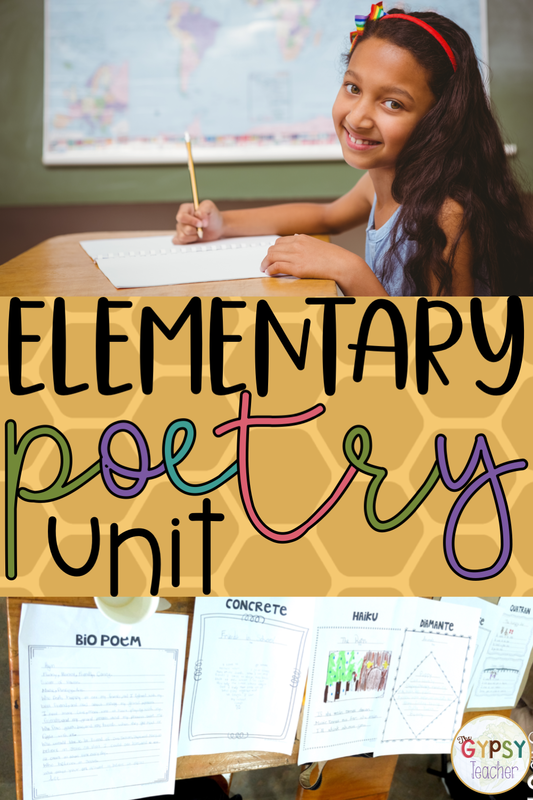 Click here to find ALL of the books for this unit! 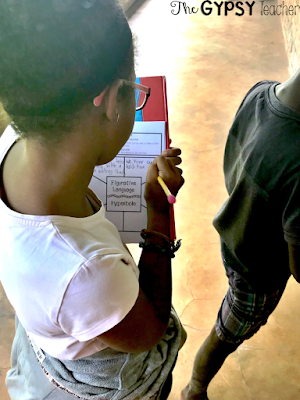 Each day I would introduce the new poem, show examples, explain how to write it using the anchor charts included in the Poetry Bundle, and then the students would work on writing that poem. At the end, they had a collection of beautiful poetry!! Once we had learned about all of the poems and wrote our final drafts, we prepared for our Poetry Café! We practiced rehearsing our poems so we would be able to read them loud and clear. I can’t wait to share our poetry café with you next week, and give you tips and ideas, as well as a FREEBIE!! It was one of my favorite moments of the school year, and the perfect way to end our unit. 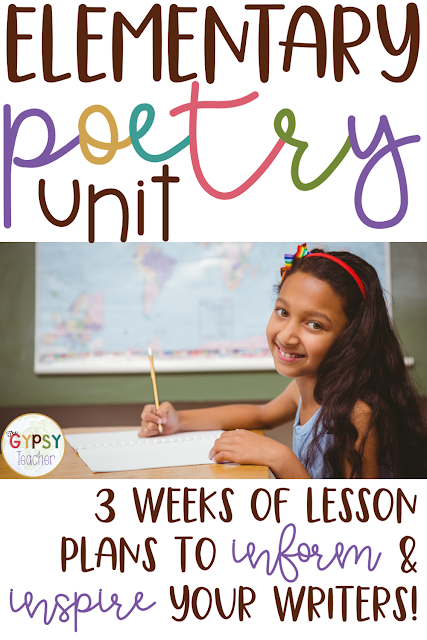 Make sure to come back for that post, and pin this one for your poetry unit!! I have a special guest on the blog today to give you some awesome teacher meal prep tips! 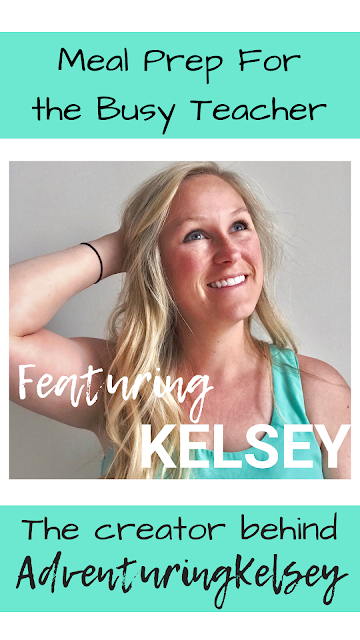 I've connected with Kelsey on Instagram - we're both teachers from Nebraska! 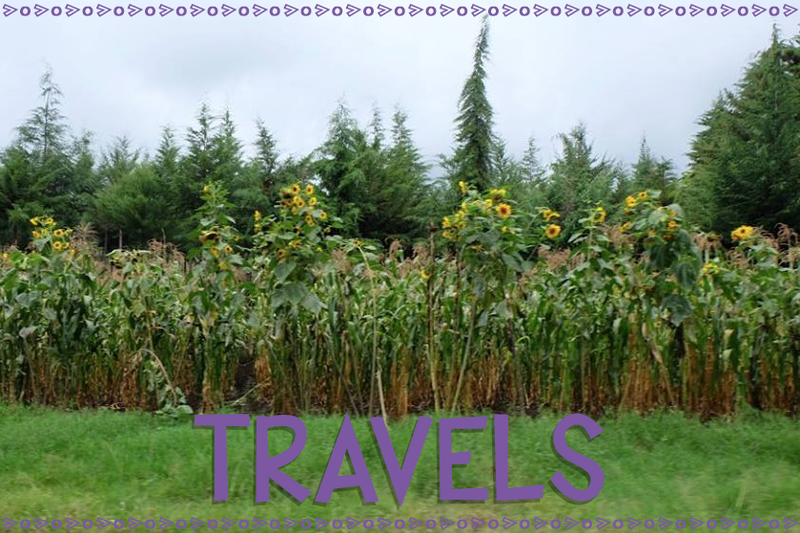 Her blog - Adventuring Kelsey - is full of awesome tips and inspiration. 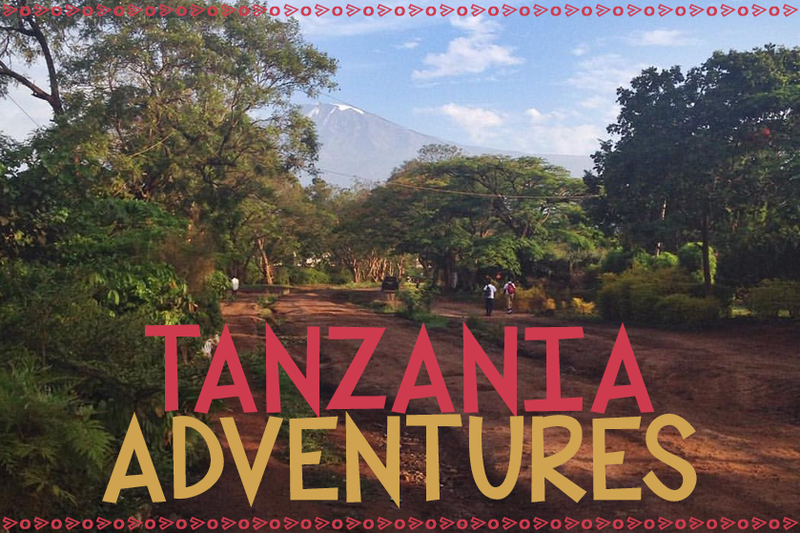 Make sure you go and follow her after reading this great blog post she wrote with you in mind! There's a freebie at the bottom for you too! Teachers, moms, and workforce women alike all have one thing in common. We want to be efficient with the time we have. We want to spend the least amount of time on chores, errands, and those annoying ungraded papers that always end up following us home, and the most amount of time with friends, family, and taking care of ourselves. 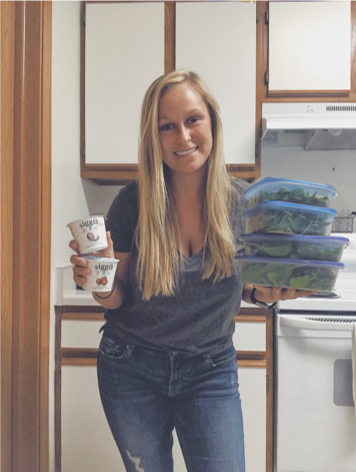 From the day I began teaching I knew that meal prepping was what I needed in my life to ensure that extra time to spend on the things that I enjoy. Being a person who pursues a healthy lifestyle, meal prepping has become very beneficial to my way of living. I can hear you now, “You’re telling me to take 3-4 hours out of my sweet weekend to plan and cook food?” Heck yeah I am. I totally get it. I know the feeling of the weekend being too short. But don’t you feel like week nights are even shorter?! Why not have an extra hour of time each night to spend with your kids, cuddling your fur baby, or catching up on your Netflix shows while still having a delicious dinner prepped and ready to go? I know that hour provides me with endless possibilities and it feels FABULOUS. Let me provide you with a few tips to get you started on this journey. Trust me. You won’t regret a minute of it. It all starts with a plan. Either write it down on a notepad or in your phone, listing out all the groceries you will need. I even go to the lengths of making sure I write down how much of each item I need. That way it won’t be necessary to make extra trips to the store throughout the week. Start by thinking through what you are prepping. What’s going to take the longest amount of time? Can you multitask by baking your chicken while you chop up the veggies? This one takes some working through, practice, and simply just experience. If something can bake while I work on preparing another item, that’s the first thing I pop in the oven. If prepping my lunch is going to be quicker than my breakfast, I start with the lunch. Think your meals through, and just know it’s going to take some time to get used to. It may sound tedious. But seriously, prep it all. The granola you’re going to put on your yogurt? Portion it out and put it in a baggie or small Tupperware. You won’t regret it when your workout ran longer than expected in the morning and you don’t have time to measure out and toss every item into your lunchbox. I get it. I know it sounds like a lot. And I’m not going to lie to you, at first it will be. But once you get in a routine you will never regret spending a couple hours of your weekend preparing your meals for the week. If you’re looking for more tips and tricks, check out my FREE Meal Prepping Guide designed just for teachers like you! In it I include 5 tips that have helped me throughout my teaching career to stay on track with health and fitness! I even provide you with some quick, healthy, recipe ideas! Loves collaborating with other exciting women! Ahh...February. The month of LOVE and KINDNESS and HISTORY. There is SO many reasons to love this month, but it can also be a struggle. We've gotten to the point of the year where students are starting to get antsy. Winter break is long gone and Spring Break can't get here fast enough. Maybe you've had a few snow days, or you're hunkered down due to indoor recess. Your classroom management strategies from August (or October...or January) aren't cutting it anymore. Can't a teacher get a BREAK?!!? I'm here for you teacher friend!! I understand your pain (you can click here for my own February madness story during my first year of teaching), and I'm here to help refresh you and your classroom to finish the year strong, with a tight-knit classroom community and a well-oiled classroom management machine! 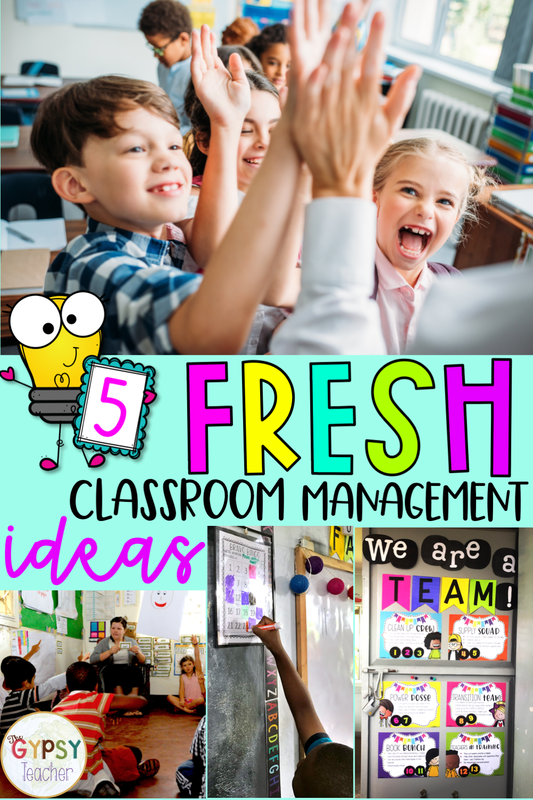 I have some FRESH classroom management ideas for your elementary classroom that will take your class from ugh to YAY!! The best part is...you can start using them TOMORROW! Just so you know, all of the Amazon links in this post are affiliate links. This means I make a small amount from any purchases made through my links, which helps me keep teaching abroad as a missionary in Tanzania! Idea #1: Assess what's working and what's not. You know your students by now - what makes them work hard, what makes them give up, what lights up their faces, and what makes them groan. Use this to your advantage! Take out a piece of paper or open up a document on your computer (yes, right now!) and write down everything that encourages and motivates your students. Write down what systems are currently working WELL in your classroom and what problems you're having. Now, let's figure out how to make your life easier by motivating your students in ways that actually work. Do they respond well to encouragement? Or do they enjoy competition? Have you tried an individual behavior management system? Or does a whole group, teamwork idea work better? Here is something that work best for ALL students: giving them ownership...whatever the reward is, let THEM decide. Take a vote, make a list, choose a random number, etc. This puts their behavior and their actions back on them. If you decide that you're having a popcorn party if they all bring homework back on time, but they don't like popcorn, the homework won't be back on time! 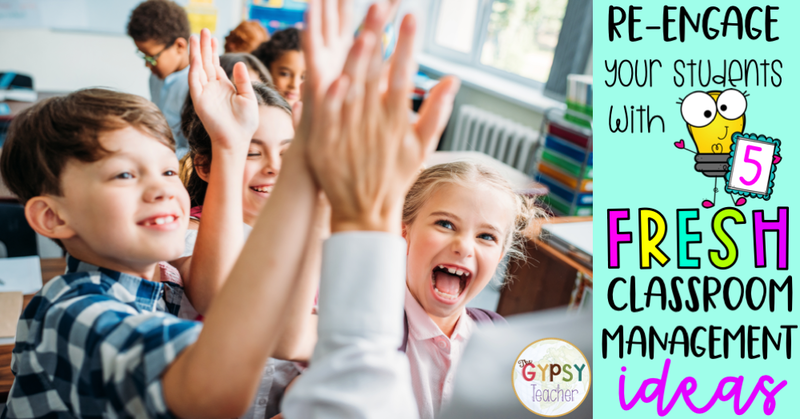 But if you vote on three suggestions that are all okay with you, and they get to choose, you bet your students will be motivated to do anything and everything to get that reward! But, I have to say, I've found a better way for you. 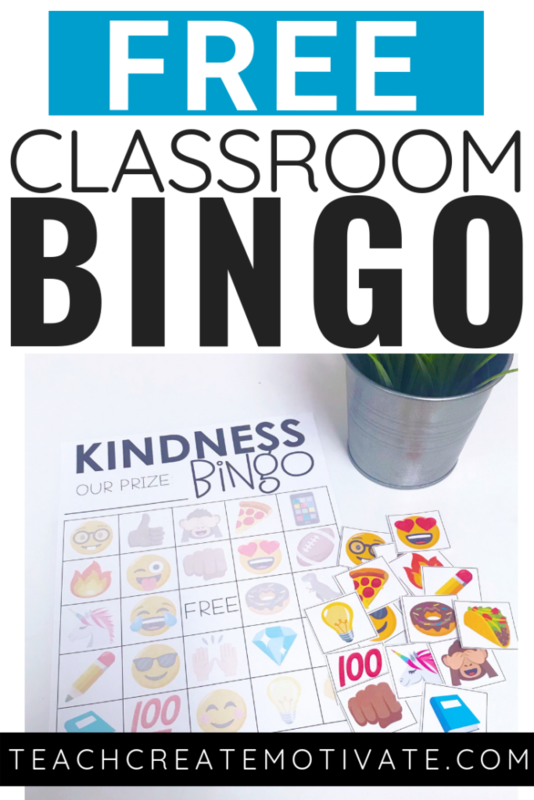 Ashley, the mastermind behind Teach Create Motivate, has made these super fun themed bingo games! She has big ones for your whole class or small ones for individuals or groups. 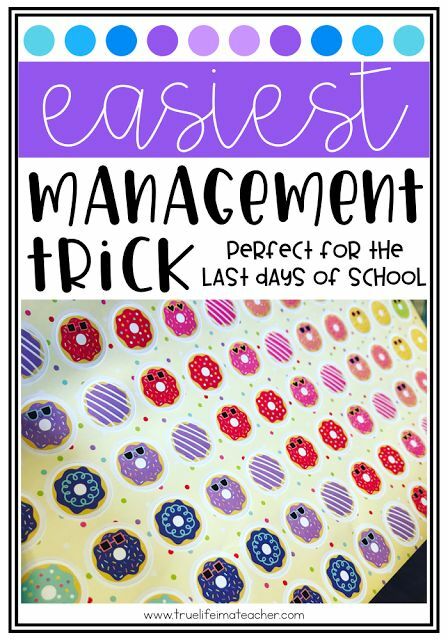 I love this because you can use it time after time or year after year by laminating every thing and using velcro!! You can get her free emoji bingo to get you started! Sometimes we all need to go back to the basics. To reset, refresh our memory, and renew our focus. 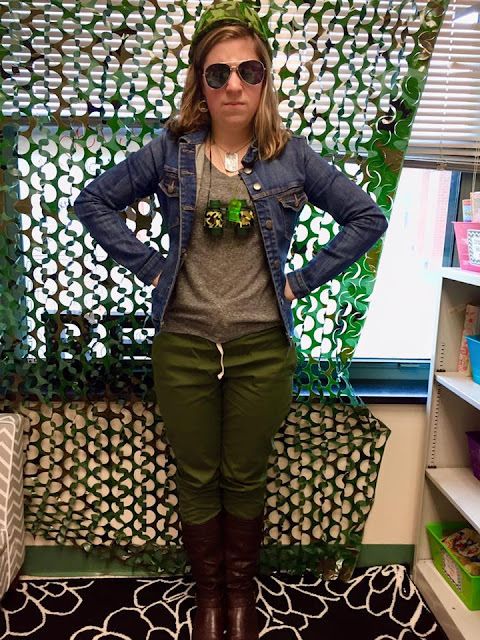 You can do this with your students by becoming a Skill Sergeant with some camo, aviators, and a whistle, putting camo plastic tablecloths on your desks, and planning a day of reviewing classroom routines & expectations along with bootcamp exercises! If you want some extra special additions, check out these inflatable tires, camo netting, camo pencils for your students, and dog tags! Michelle @ Pocketful of Primary is the cutest Skill Sergeant! Click the pic to check out her bootcamp ideas! You can also add new procedures or change some of the things that are not working on this day. 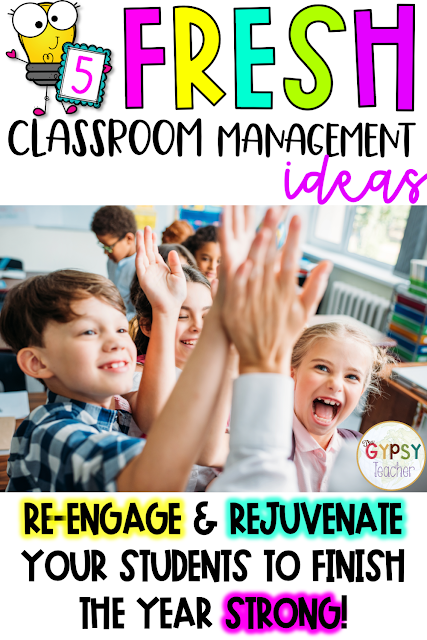 This would be a great time to implement a new classroom management strategy, like bingo above or some of the other ideas below! Both of these resources help your students practice their phonemic segmentation, inventive spelling, and writing, as well as the specific expectations in your classroom. You can use them as a reminder all year long, or at the beginning of the year. Do you have classroom jobs? Do they actually work FOR you or are they giving you more work to do? I love giving students responsibility in our classroom...because it is OURS. But, I struggled with keeping up with all the jobs, so I created Team Jobs. They have been awesome for my sanity and my classroom community! I love that each poster has the expectations and jobs for each team on them, so we can reference them throughout the year, and I don't have to explain them 5,002,743 times! They are editable too! 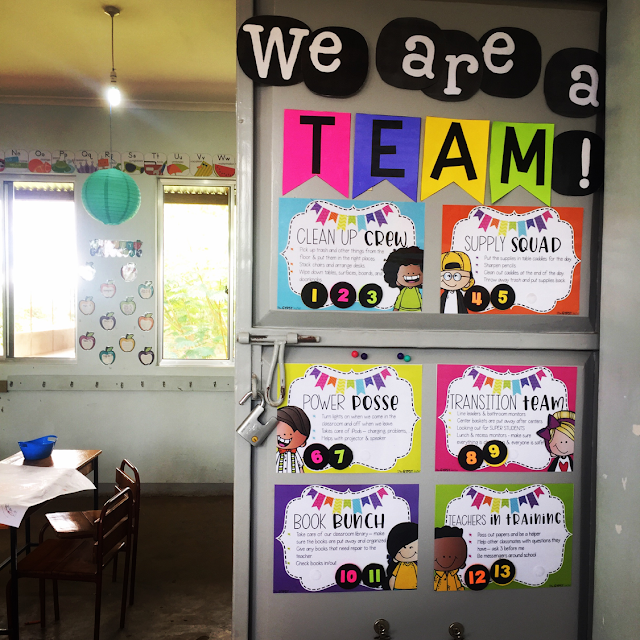 I also can switch up the teams of students so that everyone gets to work with different classmates. I have found that with team jobs, I don't have to remind students to do their jobs, because the teammates do! Each of my students have a number, and I print and laminate these numbers on Astrobrights paper on the posters that I printed and laminated. I also have velcro dots on the back of the numbers and on the posters to easily switch jobs every month. 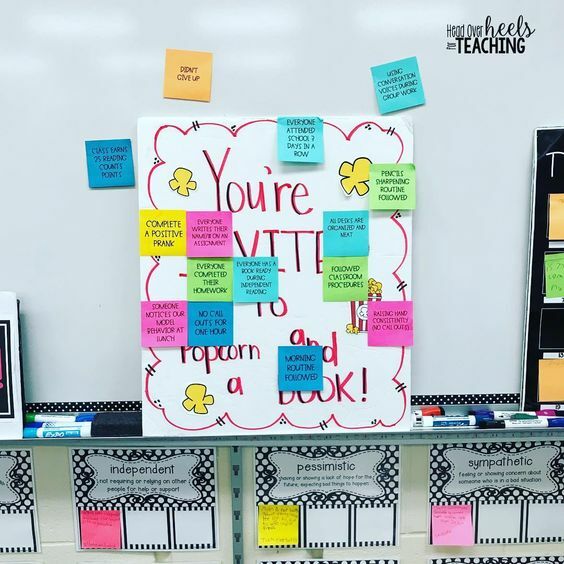 For the younger students, my friend Danielle has an awesome blog post on giving your students responsibility in keeping your classroom tidy, and some classroom job ideas too! 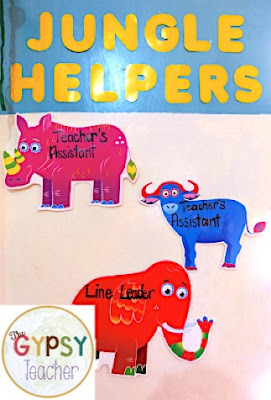 Another idea that I've used in Kindergarten is having a helper (or two) of the week. That way everyone gets lots of time to help, and you can easily remember one or two students to give tasks to (passing out papers, messenger, line leader, etc.). You can see how I display my helpers here! 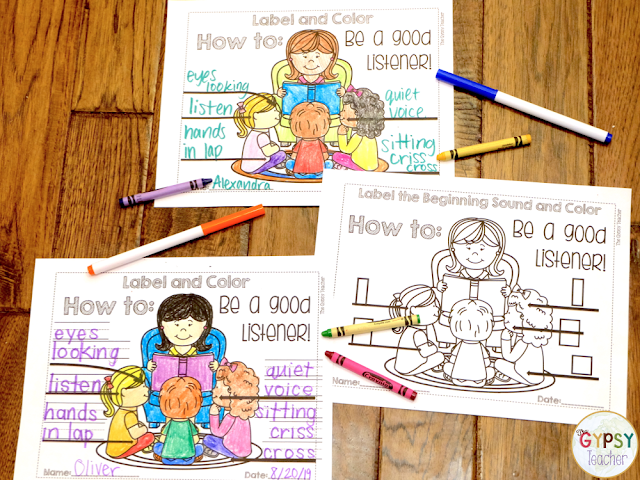 I have personally used Quiet Critters with my Kinders, and though I don't recommend using them all of the time, on those certain occasions when you do need the whole class quiet, they are FABULOUS! It feels like a classroom fairy has come and sprinkled quiet dust all over your students!! They are easy to make - sparkly pom poms, googly eyes, and foam cut into little platforms that look like feet. Here's a free label for your jar too! I'd love to hear from YOU! What are your favorite Classroom Management ideas? What has worked well for your students? 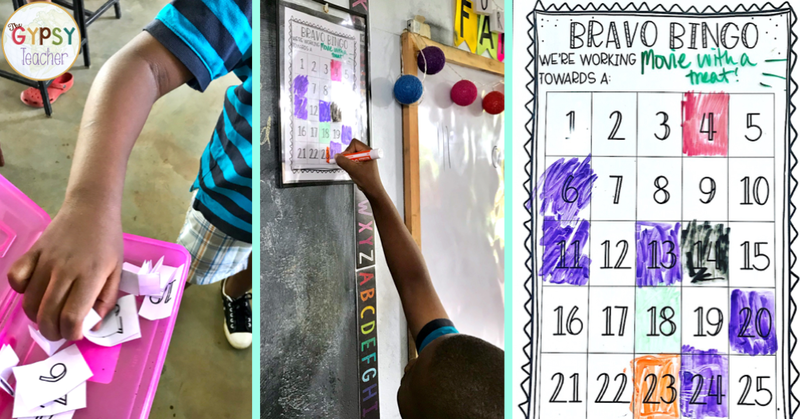 I'd love for you to pin the image below so that you can refer back to these classroom management strategies for elementary students! !